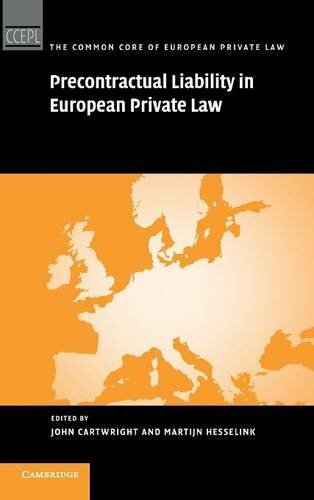 Precontractual Liability In European Private Law (The Common Core Of European Private Law): 9780521516013 Hardcover - LIMEROCK BOOKS INC. This volume analyses thirteen cases, from the perspective of sixteen national European legal systems, in order to explore the legal nature of the precontractual phase and the liability which may follow a break-off of precontractual negotiations. The precontractual phase is difficult to characterise and analyse in either legal or practical terms. The negotiating parties have begun their journey together, but they are not yet in the relationship - the contract - which is their aim. The negotiations may fail after a lengthy period in which either party may have incurred significant expenses and invested time and effort. The break-off of the negotiations may come as a shock to one party where the negotiations were far advanced, or at least where there was nothing to suggest that they were not likely to lead to their fruition in the contract. The disappointed party is therefore likely to seek a remedy. This volume examines the liability which one negotiating party may incur to another following the break-off of negotiations for a contract which occurs before the contract is concluded. The study is conducted through analysis of thirteen cases from the perspectives of sixteen national European legal systems.